Here's a grilling alternative for BBQ chicken. Start a day ahead with the brine to tenderize and season the chicken. Make an easy sauce using a store bought bbq sauce as a base. Cook it using two steps for even more flavor. Stir the water together with remaining ingredients until salt and sugar are dissolved. Combine with the chicken in a large zip lock bag and refrigerate overnight. Remove the chicken from the refrigerator about an hour before cooking. When ready to cook, remove the chicken from the brine and dry with paper towels. Heat a large skillet over medium heat. Add just a very small drizzle of oil, just enough to coat the pan. Brown the chicken on all sides, in batches so not to crowd the pan. After browning, place the chicken onto a large baking pan. Brush all sides of the chicken with the below sauce. Bake the chicken, skin side up for about 25-30 minutes. 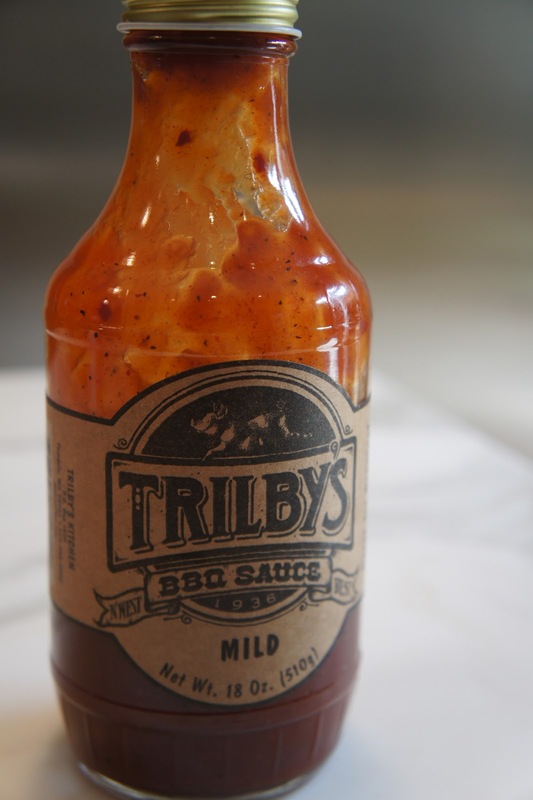 After tasting Trilby's, I decided it was really good as is and did not need really anything. The only thing I decided to do as add fried brown onions to it. Saute the onions in a little oil, over medium high heat, until they are deep brown and caramelized. About half way through cooking, add the brown sugar. When onions are browned, add the bbq sauce to it and bring just to a simmer. Remove from heat and let cool until ready to use. The girls liked their chicken with buttered spaghetti so they could mix it with a little of the residual barbecue sauce. Good eatin'!